1. Explain what is a zener diode? Zener diode is a p-n junction diode specially designed for operation in the breakdown region in reverse bias condition. 2. Explain what is zener voltage? The voltage at which the zener diode breaks down is called the zener voltage. 3. Explain what is meant by the temperature coefficient? The effect of temperature on zener voltage is given in terms of temperature coefficient which is defined as the percentage change in nominal zener voltage for each degree centigrade of change in junction temperature. 4. Explain what happens to the series current , load current and zener current when the dc input voltage of a zener regulator increases? Zener current and series current increases while the load current remains unchanged. 5. Why is zener diode used as a voltage regulator? Zener diode has the property of behaving like a dc battery in ‘on’ state (i.e. when the voltage across the zener diode exceeds its zener voltage rating VZ) . In ‘on’ state , the voltage across zener diode remains constant until the voltage across it deops less than VZ . This property of zener diode makes its use as a voltage regulator. 6. Explain how zener diode maintains constant voltage across the load? Zener diode has the property of behaving like a dc battery in ‘on’ state. If the zener diode is shunted across the load RL and the voltage across zener diode is more than the zener voltage VZ then zener diode is on ‘on’ state , and any variation in voltage across the zener diode due to variations either in supply voltage or in load resistance is not able to change the output voltage. Thus zener diode maintains voltage constant across the load. 7. Explain what is tunnel diode? Tunnel diode is a high conductivity two-terminal p-n junction doped heavily (about 1,000 times higher than a normal diode). 8. Explain what is tunneling? The mechanism of conduction in a semiconductor diode in which charge carriers (possessing very little energy) punch through a barrier directly instead of climbing over it is called tunneling. 9. 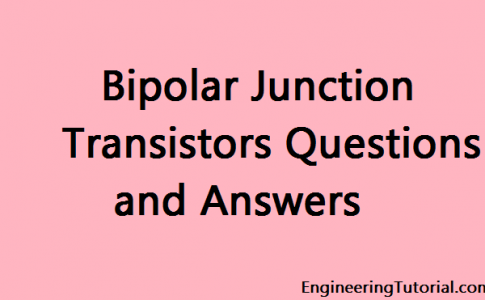 Explain what are the applications of tunnel diodes? Tunnel diodes are used as amplifiers, oscillators or switching devices, being an exclusive high-frequency component because of its very fast response inputs. 10. Explain what is PIN diode? PIN is composed of three sections with a high resistivity intrinsic layer sandwiched between p and n regions. It offers a variable resistance (decreasing with the increase in the forward current) in the forward bias mode and infinite resistance in the reverse bias mode. 11. Explain what is a varactor diode? A varactor diode is a specially fabricated p-n junction with proper impurity concentration profile and operated under reverse-biased mode so as to give a variable junction capacitance. 12. 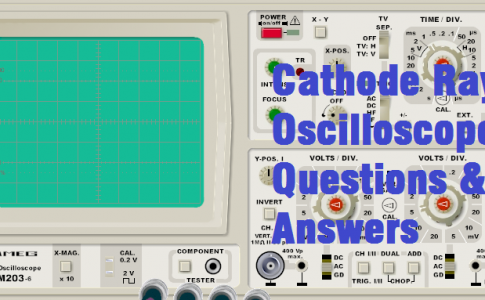 Which device produces voltage variable capacitor? How the voltage variable capacitance varies with the change in voltage across it? The varactor diode produces voltage variable capacitor. The junction capacitance of a varactor diode varies inversely as the square root of the reverse bias voltage in case of alloyed junction and varies inversely as the cube root of reverse bias voltage for diffuse junction. 13. Explain what is point contact diode? Point connect diode consists of an n-type germanium or silicon (preferably germanium) wafer about 1.25 mm suare by 0.5 mm thick, one face of which is soldered to a metal and the other face has a phosphor bronze or tungsten spring pressed against it. Because of very low capacitance, point contact diode is very much suitable for high freuency applications (of the order of 10 GHz). 14. Explain what is a step-recovery diode and why is it so called ? Step-recovery diode is a voltage-dependent variable capacitor diode with graded doping profile (concentration of charge carriers decreasing near the junction). Because of step or sudden recovery from the reverse current ON to reverse current OFF, it is called the step-recovery diode. 15. Explain what is Schottky diode? Schottky diode is uite different in construction from the normal p-n junction diode. It has metal (such as gold, silver, platinum , molybdenum, chrome or tungsten ) n one side and n-type doped silicon on the other side of the junction. It has no storage charge. The junction barrier is called the Schottky barrier. 16. Why is Schottky diode called hot-carrier diode? Since in forward bias operation of the Schottky diode, the electrons on the n-side gains enough energy to cross the junction and plunge into the metal with very large energy, they are usually called into the metal with very large energy, they are usually called hot carriers and the diode is called hot-carrier diode. 17. Explain what is back diode? Back diode is similar to a tunnel diode except that tunneling effect is large but only in the reverse direction. This is also called a unilateral diode. 18. Explain what are power diodes? 19. Why the current in power diode varies linearly rather than exponentially with voltage? The large magnitude of current in power diodes leads to ohmic drop that hides the exponential part of the V-I characteristic curve. 20. Explain what is photodiode? Photodiode is a two-terminal semiconductor p-n junction diode device and is designed to operate with reverse bias. 21. How the current is reduced to zero in a photodiode? The reverse saturation current I0 flowing through a photodiode is reduced to zero by applying a forward bias voltage of magnitude eual to barrier potential. 22. Photodiode is a photovoltaic device or a photoconductive device or both? Photodiode is a photovoltaic device as well as a photoconductive device. When it is operated with a reverse bias, it is photoconductive device and when operated without the reverse bias, it is a photovoltaic device. 23. Explain what is meant by LED? 24. Explain what precautions are reuired to be observed in the use of LEDs? LEDs should neither be reverse-biased nor operated near their maximum current rating. The leads of an LED should never be bent closer than about 2 mm from the encapsulation.